Aeroflex Limited, a wholly owned subsidiary of Aeroflex Holding Corp. (NYSE:ARX), recently announced at Productronica a major expansion to the S-Series family of innovative benchtop RF measurement instruments. 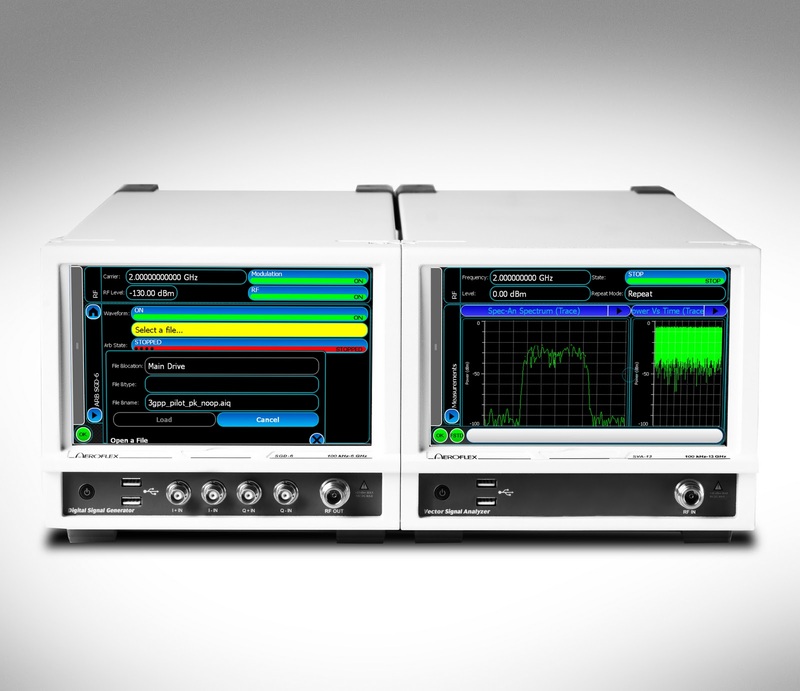 Aeroflex is adding two new S-Series digital signal generators—the SGD in both 3 GHz and 6 GHz models—and is also launching two new vector signal analyzers—the SVA, available in a 6 GHz and a 13 GHz model. The S-Series uses Aeroflex’s market-leading PXI technology. The S-Series was first introduced a year ago with the launch of the SGA analog RF signal generators. The S-Series has established a reputation for providing top-ofthe- range performance at a mid-range price, and for its ease of use via the innovative touch-screen interface. At just 4U in height and half-rack width, the instruments are compact and lightweight, with a form factor that allows a signal generator and analyzer to be accommodated side-by-side in a 19 inch rack. All S-Series instruments feature high performance features such as low phase noise and rapid settling time that would be expected to cost much more. The SGD-3 and SGD-6 both feature +13 dBm output power, with a +20 dBm option. They incorporate an IQ modulator with 300 MHz RF bandwidth, which can generate wide bandwidth modulated signals. A dual channel arbitrary waveform generator (AWG) operating at up to 250 MS/s, with memory options up to 4 GB, offers faster waveform generation and the ability to store multiple signals. The embedded IQCreator® waveform generation tool enables the user to set up a modulation scheme and create an arbitrary waveform generator (AWG) file using modulation templates. The SGD has low single sideband (SSB) phase noise of -135 dBc/Hz at 1 GHz offset, and a fast frequency settling time of 100 μs, enabling accurate receiver testing with a significant reduction in measurement time and cost. The high dynamic range of the IQ modulators provides for an Adjacent Channel Leakage Ratio (ACLR) of -71 dBc on WCDMA signals, enabling the user to design and test amplifier performance to higher specifications. The extended frequency range—up to 13 GHz for the SVA-13—allows the instrument to be used for analyzing second harmonic performance of signals in popular communications bands. A wide maximum instantaneous bandwidth up to 90 MHz makes it suitable for measuring and analyzing both narrow- and wide-bandwidth communication systems. Peak signal power levels up +30 dBm can be input directly to the instrument. With a maximum sensitivity of -148 dBm/Hz, very low level signals can easily be discriminated from noise when measuring transmitter spurious outputs. A wide range of measurement suite options are available for wireless communications test, including most 2G, 3G, 4G, WMAN, WPAN, WLAN and LTE standards, providing measurement of power, modulation quality, and spectrum parameters to the relevant standards for mobile terminal testing both in the laboratory and in production. The noise floor at 2 GHz is -138 dBc/Hz at 10 MHz offset, and, frequency settling can be achieved in 250 μs at frequencies up to 6 GHz, which makes the SVA ideal for high productivity RFIC testing. The SVA can be synchronized and used in conjunction with either the SGD signal generator or other S-Series modules, thus reducing test setup space and offering the user a simple, integrated measurement technique. Aeroflex S-Series RF signal generator family offers simplicity, portability, modularity, and RF performance at an attractive price. Aeroflex’s reputation for innovation in signal generators has been reaffirmed in the S-Series. The range of instruments was designed from the ground up to meet the expectations of today’s engineers for instant answers at the touch of a screen. Buttons, rotary controls, and deeply nested software menus have all been removed. The series now includes the Aeroflex SGA analog RF signal generators, SGD digital RF signal generators, and SVA RF vector signal analyzers. The intuitive LCD touch-screen interface common to all the S-Series instruments allows modulated or swept RF signals to be set up and analyzed using fewer keystrokes than required by traditional soft key models, thus saving time and reducing the risk of error. A modular format, featuring the Aerolock™ locking mechanism, allows additional RF instruments in the S-Series to be mechanically coupled externally by the user. Thanks to the author for explaining the facts so lucidly about the generator.